A garage floor may not be expected to blow people away with its beauty, but neither do you want people to note it for being ugly. Over time, concrete can crack and flex or become stained, making it appear worse for wear. To solve this, numerous types and brands of sealant and paint companies have developed various formulas of garage floor paint. With these products, you can often relevel your concrete slab, fixing cracks and divots, as well as protect it from stains and other chemicals. However, figuring out which one will work best for your particular needs can be an arduous process. That is why we have put together a list of the 5 best garage floor paints. Then, we offer an insightful buyer’s guide to help you understand what type of garage floor paints go best for different environments. UGL focuses exclusively on various types of paints, coatings, and sealants for a range of products and surfaces. This expertise allows the brand to manufacture a high quality product for pretty much any situation. Their concrete floor paint reflects this in a number of ways, but it should distinctly be understood as a consumer grade product. Interestingly, this is one of the few instances where consumer grade is not indicative of a general quality but more for a specific situation. 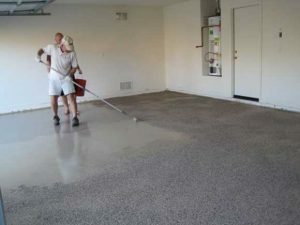 Essentially, general consumers are not likely to put this garage floor paint through the kind of abuse that mechanics or woodworkers might–something this paint will not handle as well as others. Still, this is an exceptionally easy garage floor paint to use. First, this is by far the quickest drying paint on our list, often able to be applied at the start of the day and have vehicles parked on top of it by the end. Moreover, this paint can be used indoor or outdoor as well as on top of previously painted surfaces. However, there are some distinct limitations with the Drylock, specifically, this is a surface paint exclusively. While you do not need a pristine surface for the paint to adhere, neither will this paint be suitable for leveling purposes nor does it have a high solids content. Much like UGL, Rust-Oleum specializes in various types of paints, coatings, and sealants. However, unlike UGL, Rust-Oleum covers a much wider range of scenarios. Specifically, Rust-Oleum offers products for use in industrial projects–something UGL does not. As such, it should come as no surprise that Rust-Oleum offers the best professional grade garage floor paint on our list. Keep in mind, this does not necessarily mean that this garage floor paint is better in every way than any other we reviewed. Simply, and much like the UGL, this paint has a specific situation for which it is especially well-suited. This garage floor paint will appeal to professionals primarily because of its durability. 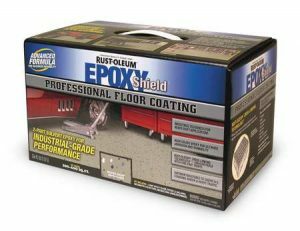 Despite being an epoxy, this garage floor paint can handle hard impacts without issue and reacts with few chemicals or solvents used in both woodworking and mechanical repair. 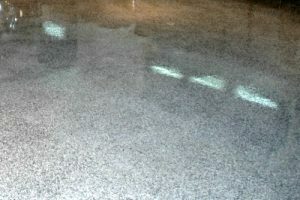 Moreover, this epoxy will bind firm with the concrete floor and offer an incredible seal to prevent environmental decay. However, it should be understood that this is a base coat, and will not provide a slick, glossy finish. In fact, the coloration may very well end up looking splotchy without a powered stirring for at least 5 minutes prior to application. Of course, as a 2 part garage floor paint, you will likely need to stir longer than that–especially if you are doing so by hand. 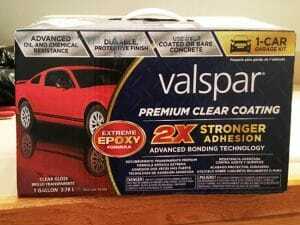 Valspar is generally far more well-noted as a brand for their paint than they are for their other coating and sealant options. However, Valspar does offer a number of products beyond paint within the same general coating category, including contractor grade products. However, Valspar can be seen as sitting somewhere between UGL and Rust-Oleum since they do not produce industrial grade products. For our list, Valspar produces the garage floor paint with the best all-around value. 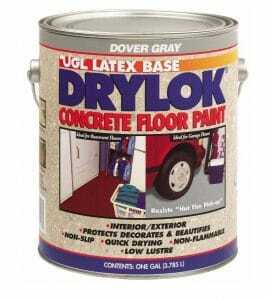 In terms of garage floor paint, this is a relatively inexpensive product that is fairly easy to apply. Moreover, this paint finishes glossy and even comes with anti-skid sand to prevent slips or falls. However, much like the Rust-Oleum was a base coat, this garage floor paint is a top coat. As such it comes with certain limitations and should not necessarily be seen as a complete product unto itself. In fact, if you do only use this product, you will need to apply more coatings than most and the ultimately durability will be questionable at best. This will also create an issue where the last of the paint will begin the curing process before it is even applied. Much UGL, KILZ has a bit more limited product line than some of the other brands on our list, though KILZ is more well known and respected. A lot of this has to do with the fact that KILZ primers are some of the best available, often considered a standard among professional construction workers. For a garage floor paint, this brand offers something a bit unique. While the UGL was essentially a 1 part latex based garage floor paint, this is the only acrylic garage floor paint on our list. This presents some interesting advantages, but ultimately, the limitations do similarly place it in the consumer grade as the UGL. Though, this can be an excellent product if you have a large area that will not see the heaviest of traffic or abuse. This is two-fold: first, this is by far the least expensive product on our list at half the price of the next competitor. However, this garage floor paint also has the advantage of potentially stretching further than even the manufacturer suggests. Of course, the price and ability to extend further come at the cost of durability–the primary reason this is a consumer grade product. Moreover, because it is an acrylic combination, the drying time of this garage floor paint can take days–maybe even up to a week. Quikrete is the only brand on our list that does not specialize in paints, coatings, and sealants. However, this should not be seen as a disadvantage, because Quikrete instead focuses not on the product itself but the situation for which it is used. Specifically, Quikrete is a masonry brand. As such, this gives Quikrete a unique insight into the material upon which the garage floor paint will be applied. 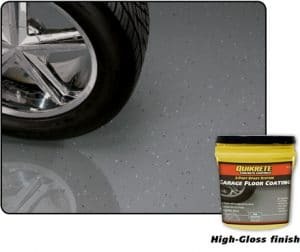 Knowing better how concrete itself works allows Quikrete to create a product that rivals the Rust-Oleum for the best professional garage floor paint–though, this product’s limitations may not make that tenable unless used for new construction. Regardless, this garage floor paint is one of the most durable on our list for pretty much every measure of that consideration including environmental and heat. Moreover, this garage floor paint will adhere even on a wet floor and provides one of the best glossy finishes with even color. However, this is also a fairly difficult garage floor paint to work with. For one, the 2 part composition will require far more time and effort to prepare–not to mention it is exceptionally viscous and will take more patience when rolling out. Furthermore, this product will often cover less than advertised to get a proper coating–a problem made more glaring by its fairly high cost. 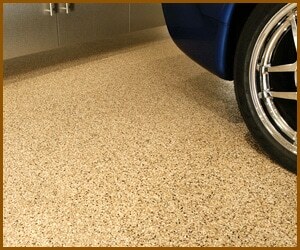 One of the primary considerations when choosing a garage floor paint will be what the actual material of the paint is. Depending on the material chosen, your garage floor will hold up better under some conditions rather than others. This is not simply a preference issue there is a notable step up in certain materials. How to choose floor paint material that will fit your best needs? There are five primary materials used for garage floor paint: epoxies, urethanes, acrylics, latex and polyureas. Keep in mind, not all of these are technically “paints,” but they are all applied in a similar manner either rolled or sprayed onto the floor of your garage. Another thing to keep in mind is that garage floor paint is designated as such because it is generally not intended for use outdoors. That does not always apply for every material. Moreover, it is not uncommon to layer different types of garage floor paint over top one another — assuming they are rated to do so. Latex is your basic paint. This is true whether you are talking about a garage floor or a bathroom wall or anywhere else really. This is material can be a bit expensive, and is not necessarily the best choice depending on what you do in your garage. While it seals well enough, it does not provide the best seal available. However, it is one of the few garage floor paints that is generally also rated for outdoor use. Moreover, latex based garage floor paints often have some of the quickest drying times. Finally, it is generally fairly easy to apply latex garage floor paint though, the garage floor will need to be fully cleaned and cured. In fact, that might be one of the main disadvantages of latex based garage floor paints. If the surface is not properly cleaned and cured, it will not only be obvious but potentially lead to long term durability issues with the paint job. This situation is further compounded by the fact that latex based garage floor paint is one of the less durable in general. The next material is acrylic. 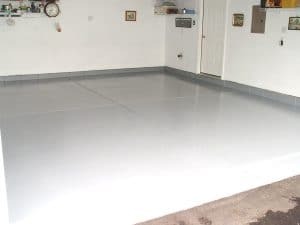 Much like latex, this type of garage floor paint can either be applied on top of a primed garage floor or be included with the primer as a 2-in-1 setup. However, acrylic and latex based garage floor paints often stop there in terms of their similarities. Ultimately, acrylic is a far less reliable material than latex and should not be used in garages that will see a great deal of foot traffic or work. If you park your car, make sure that the wheels are not too hot as acrylic will often peel off under especially warm tires. On the plus side, acrylic based garage floor paints are often the cheapest on the market. The “middle child” or garage floor paints is epoxies. 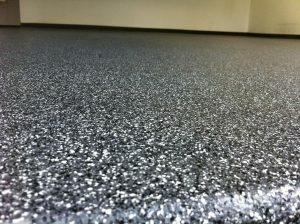 This material is often combined with either latex or acrylic but can often be used as a stand-alone garage floor paint. However, it should be understood that this is a bit of a misnomer. Epoxy is technically a glue, not a type of paint. Still, for all intents and purposes, it functions similarly enough with some distinct advantages. First, a good epoxy is one of the better sealants available, better than latex or acrylic. Moreover, epoxy is incredibly cheap even at the higher ends of the quality spectrum. Finally, a high-quality epoxy is also fairly durable, resisting cracking, flaking, or melting under hot wheels. However, epoxies do have a couple drawbacks. One of the primary issues with this material is the extremely long drying times. Whereas latex and acrylic can dry within a day’s time, epoxies will often require a minimum of a day, and sometimes more, before you can even walk on them, let alone park a car on it. The next material, polyurethane, or urethane for short — though they are actually two different materials, is a bit like a superior version of epoxy. Urethane accomplishes pretty much everything epoxy does but better with the addition of more features. For instance, urethane is more flexible than epoxy, which allows it to absorb impacts better. Moreover, urethane is just as stain resistant, but urethane provides a better resistance to chemicals, including powerful solvents like paint thinner. Finally, urethane will not yellow when exposed to sunlight like epoxy and can handle wider differences of temperature or humidity better. However, urethane does not necessarily work as well with concrete exclusively. Specifically, urethan does not bond to concrete as effectively, which can lead to flaking further down the line. Moreover, urethane is much thinner than epoxy which limits its usefulness as a leveling paint. In fact, it is not uncommon for urethane to actually be layered on top of epoxy, rather than used directly on the exposed concrete. The final material often used as a garage floor paint is polyureas and is actually a subset of polyurethanes. However, for consumer installed polyureas, only polyaspartics are advised as polyureas dry in as little as 5 seconds and are hard within 5 minutes. 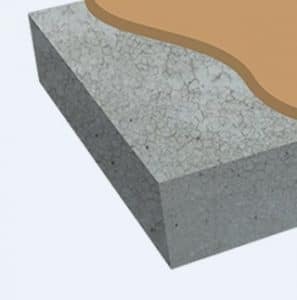 This material is just as durable as polyurethane but bonds even better to exposed concrete and can be used for mild leveling. However, polyaspartics are distinctly not advised for a mechanic’s garage as it does not handle battery acid as well as other urethanes or epoxies. Moreover, this is easily the most expensive garage floor paint on the market, and the quick drying time almost necessitates a professional installation which only adds further cost to the project. When It comes right down to it, this is the most important factor when choosing a garage floor paint. None of the other considerations matter much if the paint does not hold up under the stresses of your garage use. Of course, different people will have different requirements. For instance, a person who simply wants a nicer finish on top of their concrete garage floor will have an entirely different set of standards that someone who regularly works on their car or even has a workshop set up. Ultimately, the durability of a garage floor paint can often be broken down into four distinct scenarios: heat, chemical, abrasion, and environmental. Heat may seem to refer to the environment, but this one is actually localized to the wheels of your vehicle specifically. Basically, as you drive, the rubber of your vehicle’s tires heats up. When you then park your vehicle on top of a garage floor that has been painted, that heat can weaken the paint’s bond and stick to the tire, being pulled up when you then drive off. This can also occur due to extreme pressure from exceptionally vehicles–regardless the standing rubber’s temperature. Chemical durability will often be more relevant for mechanics, woodworkers, or other craftsman. Often, those professions or hobbies require the use of various chemicals which can stain or be corrosive. However, the ability of a garage floor paint in this regard often has more to do with how its material interacts with various chemicals than its overall quality. In this regard, you will need to research the way various chemicals you intend to use interact with various garage floor paint materials. Abrasion and impact durability are generally determined by the garage floor paint’s flexibility. Essentially, the more flexible the garage floor paint material, the more durable to impacts and abrasions it will generally be. Environmental durability is defined by how well the garage floor paint responds to extreme temperatures and varying degrees of wetness or humidity. A poor garage floor paint will crack if the temperatures swing between hot and cold extremes. Moreover, they may lose adhesion to the concrete floor is exposed to too much humidity or standing water. After durability, the degree to which the garage floor paint bonds with your concrete floor should be a primary concern. It does not matter if the garage floor paint can stand up to a nuclear blast if it will not stay bonded with the concrete floor. Oddly, some of the more durable products are also the ones that have the most difficult bonding with concrete. Keep in mind, for products that have more difficulty bonding with concrete than others, you can often alleviate this by thoroughly having your floor prepared–potentially by professionals. Installation refers explicitly to the process of preparing and laying down the garage floor paint. Depending on which material you intend to use, this can be a fairly easy and straightforward process or a long and drawn out one. 1 part garage floor paints are often the easiest to install. They do not require you to mix two different substances together and will regularly roll out easily. However, 1 part garage floor paints will still need to be mixed, and they are regularly an inferior quality when compared to 2 part paints. Though, while 2 part paints may provide a better-finished product, they often require a far more time and energy consuming preparation process. First, they require far more mixing than 1 part paints. Moreover, they are often more viscous by nature, making them more difficult to roll out. The amount of time it takes for the garage floor paint to dry and harden should, like installation, be seen more as a secondary concern. The curing process will not affect the overall process of your project unless the material has strict environmental requirements that your garage cannot meet–maybe a garage located in an arid or desert region will see temperatures of over 100 degrees by day that drop to under 50 degrees at night. Still, the general concern with the curing process often relates more to time than to the finished result. Essentially, different materials require the garage floor paint set longer than others–especially in regards to when you can park a vehicle on top of it. This difference can even be days. Still, if a high-quality garage floor paint requires a great deal of time, it is better to wait than opt for a less effecting, quicker setting product. As we can see, what you do in your garage will heavily influence which garage floor paint you should choose, with no one product being the uncontested “best.” However, most of the common garage scenarios are covered on our list. 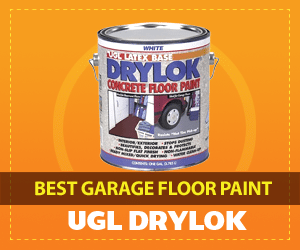 For instance, if you are simply a consumer who wants a nice paint to spruce up the garage but do not engage in woodworking or mechanical repair, the UGL can suit you ideally. 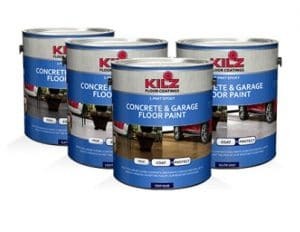 Likewise, the KILZ acrylic can also produce a nice appearance for lightly used garages. However, if you need to use the garage for professional purposes, then you will want to look at either the Rust-Oleum or the Quikrete. While they are both pretty similar in terms of durability and adhesion, the Rust-Oleum does have a slight advantage in investment since it covers more area, but the Quikrete will often produce a nicer looking result. I have a garage floor that was painted 2 years ago. It has a couple of spots that flaked off. The more frustrating part is that the tires leave Yellowish-brown spots where you park. I now use runners to put under the tires so it will still look good. This defeats the purpose of a painted garage in my opinion. With the UGL, can I paint over my current paint? And will I see the same problem??? Thank you. 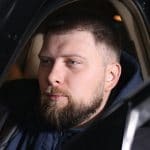 A very good put together article. So educational, thank you! Thinking of surprising my husband while he’s away and painting the garage floor. The article was very informative. I believe I’ll most likely use the Rustoleum or Quikrete because of their benefits. Please though, pardon my frustration with the multiple typos contained in the report. I have used Valspar latex floor paint, two coats following directions and two coats of recommended sealer, and it is not durable to foot traffic or water. It definately is not durable. I worked really hard and I’m very dissatisfied.